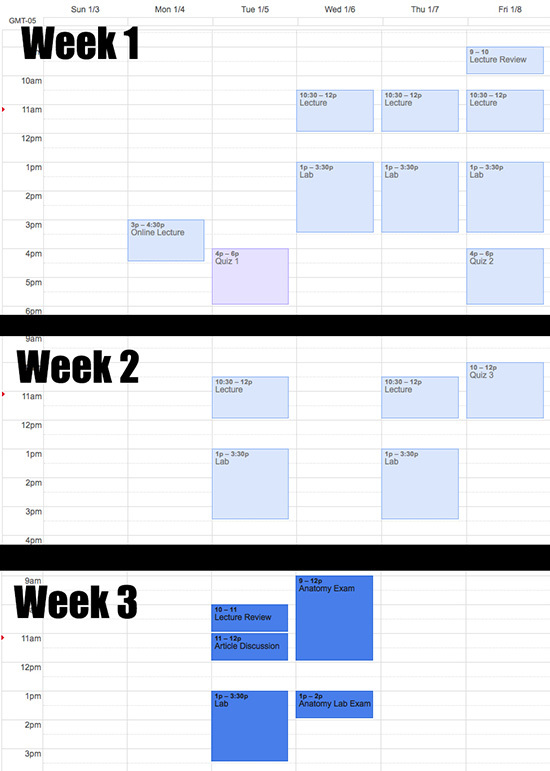 This is our schedule for the winter semester. It’s just one anatomy class for 1 unit, just the abdominopelvic region. Lab and lecture are combined, and the class is 25% quizzes, 5% article discussion, 35% lab exam and 35% lecture exam. It’s pretty weird to have only one large test for the majority of the grade. I’ve been struggling with studying. By struggling, I mean I haven’t really started studying. I have the next 4 days to learn everything which is plenty of time, but I should have started studying earlier. Instead I’ve been going to the gym a lot. I’ve exercised almost every day, so I’m finally back into the habit of working out regularly. My plan is to keep it up during spring semester, and the best way is to go in the morning before class. That means I’ll have to wake up around 6:30 which is annoying, but I always find excuses to not go to the gym after class. I also started watching “Making a Murderer” because pretty much my entire class watched it over winter break. I’ve just watched the first episode, but I know that I won’t be watching this before bedtime. I started rewatching Game of Thrones too. I initially watched the first 3 seasons while I was painting, so I missed pretty much everything, and then the 4th and 5th seasons didn’t make any sense. It’s great to rewatch though, because now I know all the characters and the storylines are so much easier to follow. A group of us are also planning on doing a trip to the snow next week. I’m hoping that everything still works out! We’re thinking of going snowboarding for two days in Pennsylvania, which is cool because I’ve never been there. I’m also not the best at snowboarding, but neither are my classmates, so it’ll be fun to have others to compete with. Did you and your classmates watch any TV shows together? Comment below!